Black walnuts are prized for their unique flavor and are used in pies and other pastries and Native Americans used the hulls for digestive health. The culprit is the walnut twig beetle, who carries the spores of the fungus that causes Thousand Cankers Disease. 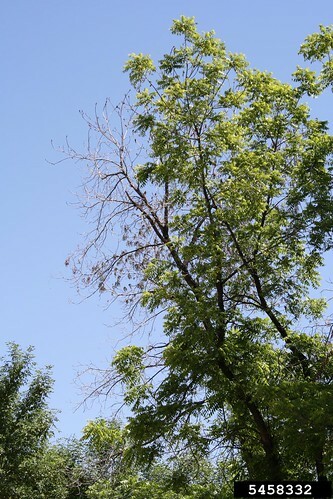 The disease is somewhat unique in that it is native to the western United States, but now that it has spread eastward, courtesy the tiny beetle, and attacks black walnuts, which have no resistance. “We’ve seen invasive species nearly cause the extinction of valuable native American tree species such as elm and chestnut. Historically, both have been economically important trees in the U.S.,” said Tamara Walkingstick, associate director of the Arkansas Forest Resource Center of the University of Arkansas System Division of Agriculture. Sadly, there’s no reliable way to control Thousand Cankers Disease, but humans can prevent further spread by not moving firewood or unprocessed black walnut wood or nursery stock from or into restricted areas. Recommendations are for infested trees to be cut down and burned on site, or if burning is not possible, then the tree should be cut down and left to decompose on site. The cankers expand and girdle infected trees, disrupting flow of water and nutrients. The leaves will turn yellow, wilt and turn brown. Branches will die and the whole tree will succumb about three years after the first symptoms of decline show. Thousand Cankers has been found in eastern Tennessee, Virginia and Pennsylvania. Extension Forester Jon Barry said it’s important for the public to know how to identify invasive species and understand how these non-native pests spread. To learn more about thousand cankers disease, visit www.thousandcankers.com/.